Tuesday I attended the second session of a Workshop II floral design class offered through my garden club. We began the class by practicing leaf manipulation, then used the altered leaves to develop a Creative Design. As a novice student in the area of floral design it is difficult to know, much less explain, exactly what creative floral design is. The goal I believe is to fabricate a design no one else has ever done (conceptual originality), using basic design principles that apply to any artistic endeavor (foundational standards), and exhibiting consummate craftsmanship. None of these criteria are met by the arrangement I created on Tuesday, but after having been throughout the exercise I do believe I am beginning to internalize the goals. Our teacher, Betsy, has a network of floral suppliers and for a small fee she provides each student the flowers and foliage to complete the design. This is helpful so that we all start out with the appropriate materials each time. Betsy is a garden club member, an experienced floral designer and a flower show judge. Two other members assist with the class, both of whom are also flower designers, and one is also a judge. I really appreciate that these women volunteer their time and expertise to help educate club members in floral design. 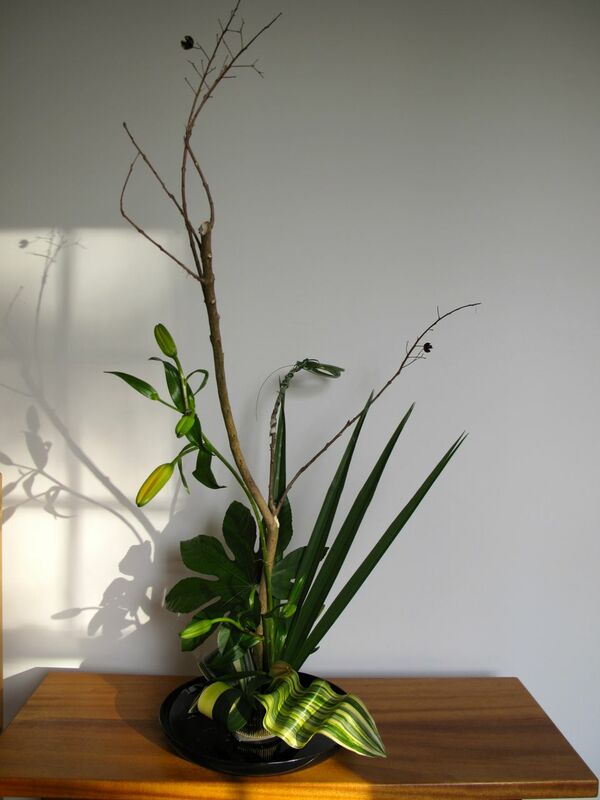 For class this week we were asked to bring an interesting branch, 1-2 inches thick and at least 20 inches high. 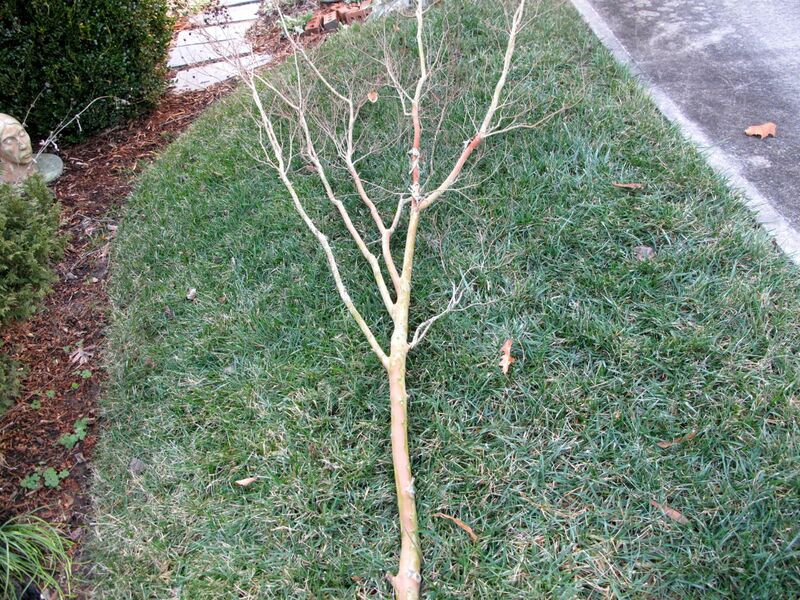 Yesterday my husband helped me prune an outlier branch from a Lagerstroemia (Crape Myrtle) to use for this project. Unfortunately choosing a 20-inch section that had interesting curves proved challenging, but I sectioned a piece from the top that seemed to meet the criteria. I saved some of the wood for another project. Once in class the base of the branch had to be scored or split to allow the branch to be inserted into a 3-inch florist pin holder. The lines of the branch established the line of the design. What I learned as I moved through the course was that the branch I chose proved to be too wispy and busy, not really strong or hefty enough to compete with the weight of the leaves and flowers we used. Thankfully the teachers gave lots of helpful comments, explanations and hands-on assistance, so I probably learned more by having to compensate for the size of the branch. With the branch in place we turned our attention to leaf manipulation. We began trimming, folding, cutting, braiding, weaving and looping our leaves. This activity could have consumed the entire two hours of the class. My teacher Betsy demonstrated an interesting technique using an aspidistra leaf. She applied peel-off UGlu adhesive patches along the back spine of the leaf and lay medium weight florist wire down the spine. 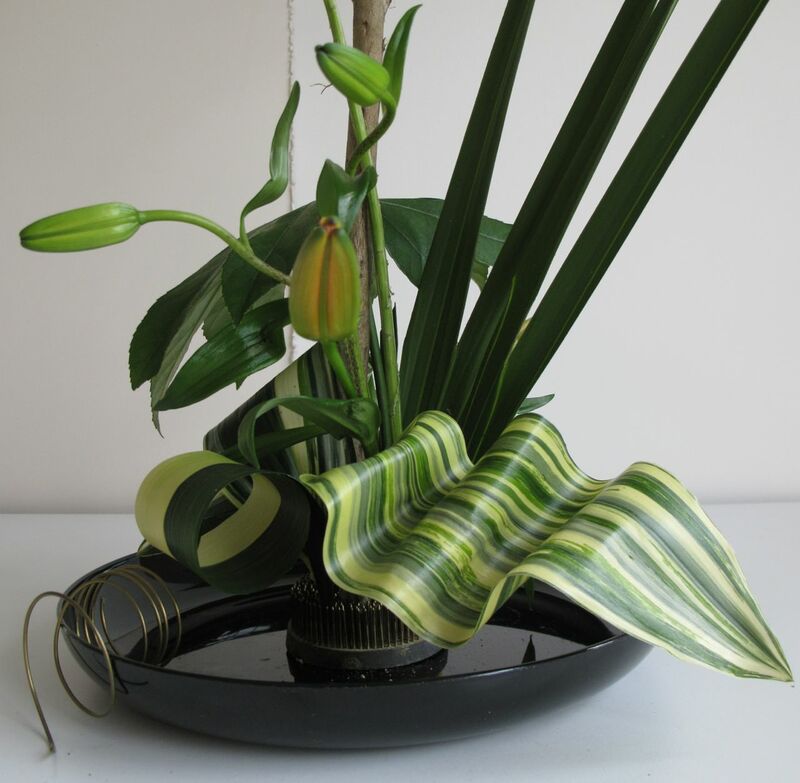 Next she trimmed an inch-wide strip from the length of a second aspidistra leaf and used it to cover the wire. With the wire in place the leaf can be then be folded, scrunched, twisted or otherwise manipulated and the shape will hold. Without a clear design idea in mind it took me a while to get started with the alterations I was so afraid of “messing up” which is always something I must always overcome when learning a new activity. By nature I am usually very reflective and like to weigh all the possibilities, but the class time was extremely limited of course. I finally conquered my timidity and began preparing the leaves. 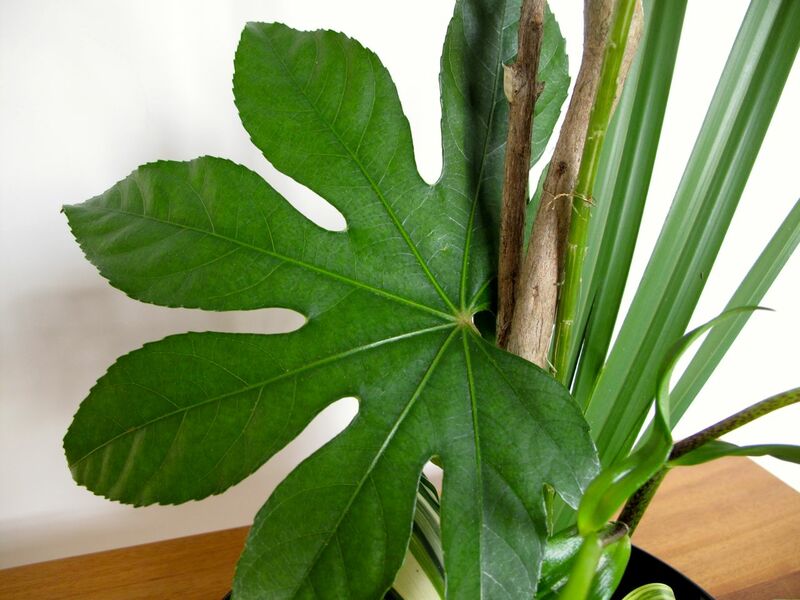 Eventually I inserted an Fatsia leaf (without manipulating it), added an accordion-folded, wired Aspidistra leaf and add a couple of other rolled Aspidistras. 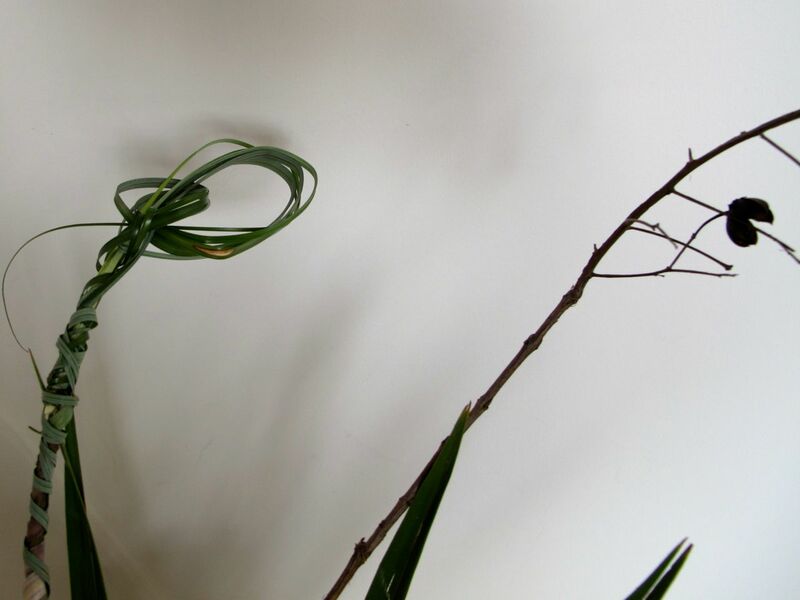 I also made a loose loop using half-dozen strands of beargrass and used a quarter section of a fan palm to complete the foliage. The looped beargrass did not survive the car ride home so I learned a valuable lesson. The leaves have to be stapled, glued, wired or otherwise securely fastened. 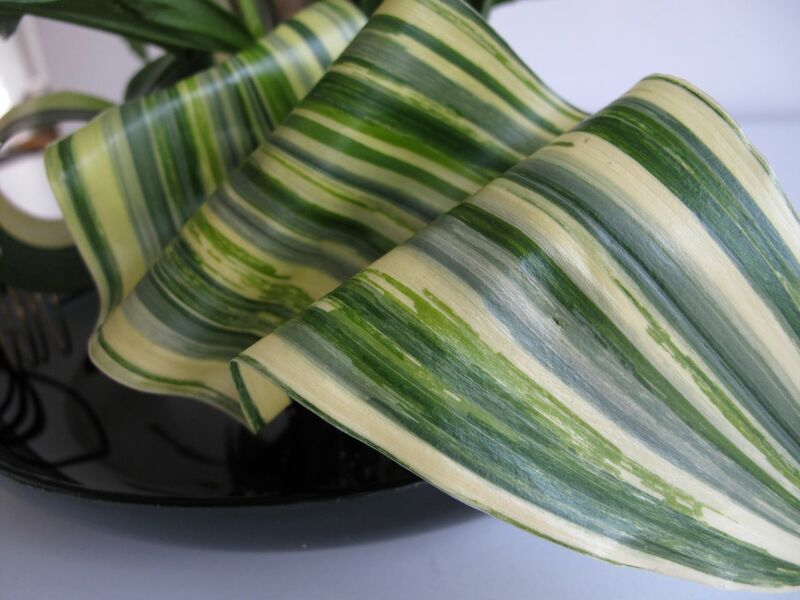 I really liked working with aspidistra leaves. Each one has a unique pattern. 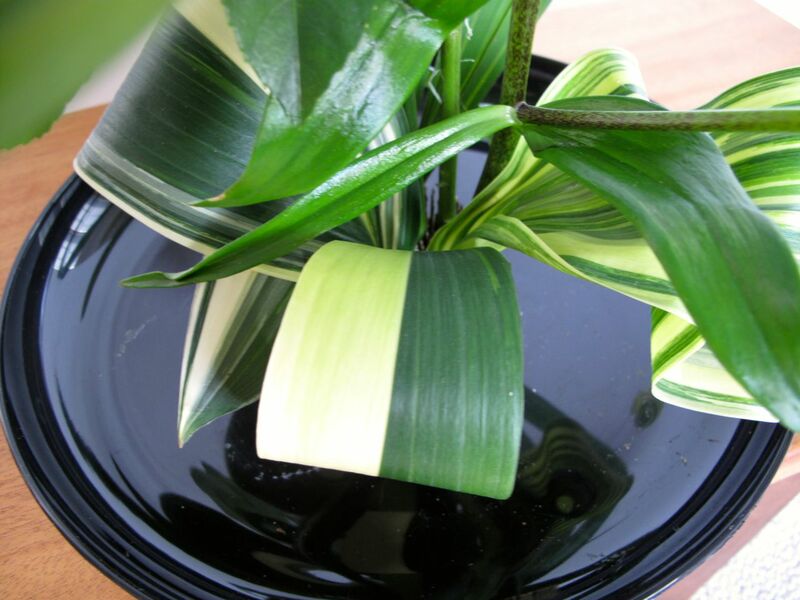 Bicolored Aspidistra was trimmed to make it narrower, then rolled and glued. By this time I became more decisive and ended up trimming away quite a lot of the wispy branches and several major ones. Less is more in creative design. With a great deal of conversation and guidance from the instructors the arrangement began to take shape. Betsy helped me place three tightly closed Asiatic lilies, the only flowers used in the design. Each lily was cut to be a different height. Two were placed in front and one was added in back near the base. It will be interesting to see how the design changes as the lilies open. After two days they have opened only slightly. Some of the materials had shifted around during the car ride so I reworked them before photographing the arrangement once I got home. The angle I worked from is hard to recapture in the photographs. Slight shifts in the camera angle really change the effect so the design integrity needs to be strong from all frontal and side points of view. Having gone through the class this week I realize I have a lot of work to do to prepare for an upcoming Floral Design Guild event. 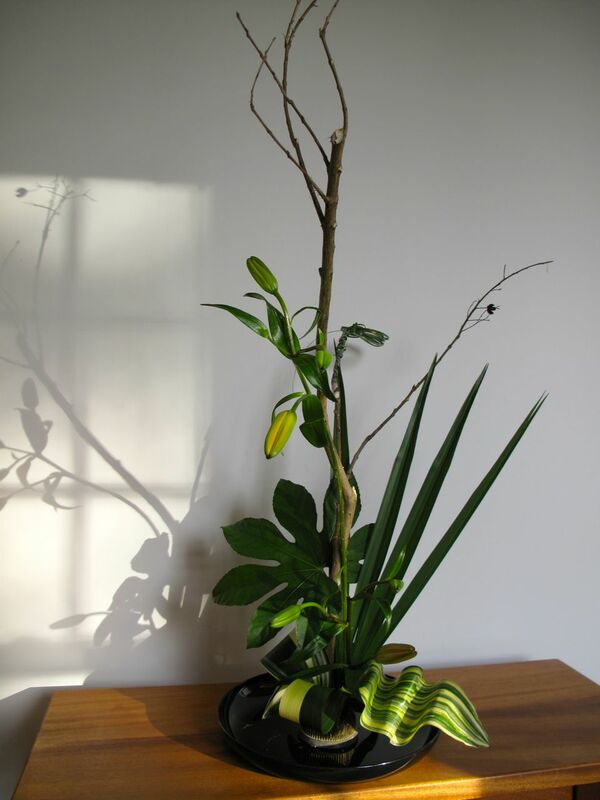 For this I have to come up with a concept, select a container and appropriate background, devise necessary mechanics to ensure the arrangement stands up properly and select the flowers and foliage. February will be here soon. Hoping to come up with a bold and dynamic design, I also have to keep reminding myself to relax and enjoy the journey. This entry was posted in garden and tagged floral arranging, Floral Design, flower arranging, flower design, manipulating leaves, nature photography on January 23, 2015 by pbmgarden.